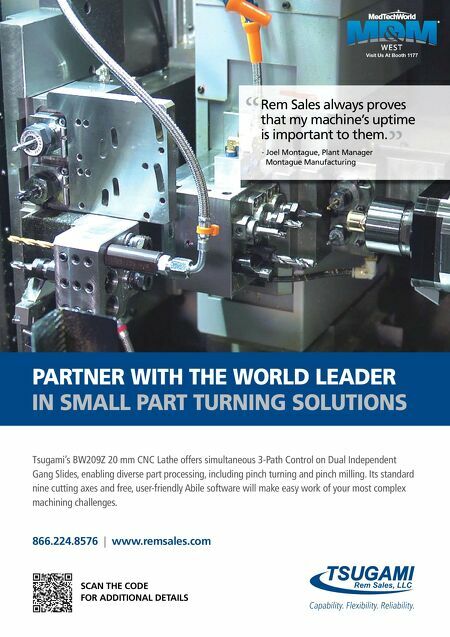 106 MMS January 2017 mmsonline.com BETTER PRODUCTION Shops Using Technology HELLER MACHINE TOOLS PROBLEM Needed to improve metal- removal rates during roughing and heavy-duty machining SOLUTION Haimer Safe-Lock system with drive pins and spiral grooves RESULTS Performed high-feed slotting of up to 2×D or more in difficult-to- machine materials Toolholding for Heavy-Duty Machining M etal-removal rates during roughing and h e av y- d u t y m a c h i n i n g o p e r ati o n s a re crucial for the productivit y of the machining o p e rati o n. To im p rove th e s e rate s, G e r m a n machine tool builder Heller, whose U.S. head- quarters are located in Troy, Michigan, focused o n th e i m p o r t a n c e of th e to o l h o l d e r. U s i n g special shrink-fit chucks from Haimer USA (Villa Park, Illinois) with drive pins and spiral grooves in the tool shank to secure the cut ter/holder i nte r fac e, th e c o m pa ny p e r fo r m s h i g h-fe e d In a study, German machine tool builder Heller performed a roughing operation in titanium without the Safe-Lock. The tool pulled out of the standard shrink-fit chuck and broke at 2×D. 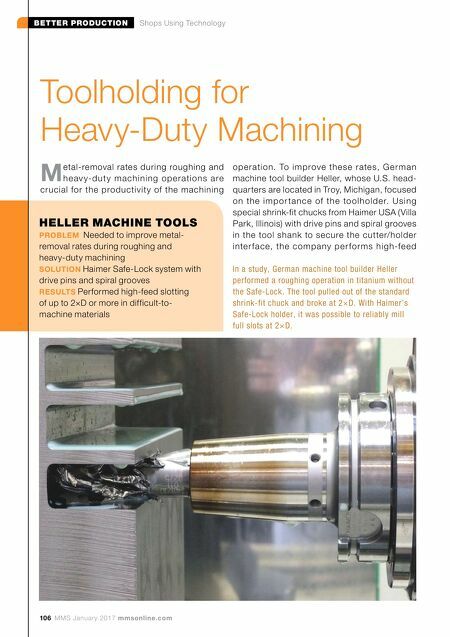 With Haimer's Safe-Lock holder, it was possible to reliably mill full slots at 2×D.